Welcome to our complete solution to Anna's Quest. Here you will find out how you can solve the bravely little girl Anna’s tasks without difficulty. 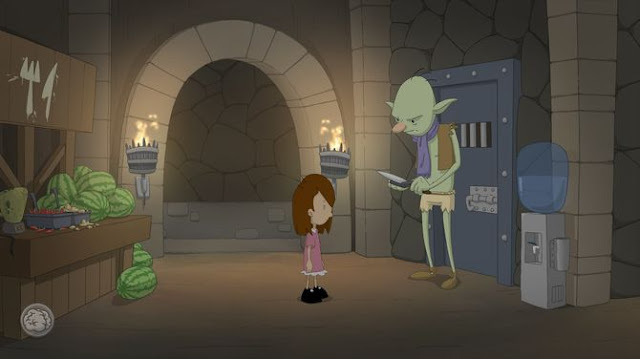 The game starts and you have to witness how the little girl Anna from the evil witch Winfriede kidnapped and imprisoned in a room. You begin the tutorial, which is to bring the ease of use of the game in more detail, you can skip this if you can stand out as an old Click & Point veterans course. By pressing the left mouse button you can interact with objects and move Anna to desired locations of the Map. - Click therefore with the left mouse button on the chair, which you bring Anna to sit down on this. After a short dialogue asks your tormentor, the Witch Winfriede, you shall take the spoon out of the soup and this bend through your telekinetic powers. - Click on the coveted silverware pieces and open the inventory by either the "I" button pressed, or use the mouse wheel. Operate next brain icon at the bottom left and set this one together with the spoon. Hopp, already you have the spoon bent and witch displays by the camera. - After talking you should give your attention to the teddy bear, you can see him at first by right-clicking on it and then talk to by left-clicking. Go through all dialogue options and end the call. By right-clicking you look now the head of the machine. - Get your scissors and used it first to the unicorn to cut his horn. Then you use the horn to open the machine. Cancel the ball and combine it with the scissors by half a ball to make it. - Now you can pick up from the ground the electrical part. By placing the helmet your telekinetic strength is now enhanced, which uses her once on the camera. Now you can no longer see the witch, so she makes her way to you. To leave the room now, you use the brain icon on the door to open it telekinetically. Your freedom still leaves hope for, because the bottom is already waiting the witch Winfriede upon you. You find yourself at the entrance of the building, the witch is coming and wants you. To the collar First Look at the painting and put yourself up, while the Spirit Joringel detained who tells you his sad story and he wants to help you with your escape. - Click to get to the red carpet and then on the spout to some mold. Get your crayons from Anna's room and painted the mold with the yellow color in order to make it look like cheese. Use the "cheese" in the rat, it can therefore fall off the key. Go down and used to open it and behind it to reveal a safe key at the paintings. - Return again in Anna's bedroom and grab the pillow and the interior of the cut off unicorn. Use your scissors to get the curtains to some velvet. To get now a chic pillow, her stuffed the bleak thing for the time being with the inner workings of the soft toy and put the velvet it. - Make your way down to the entrance hall and give the cat's embellished pillows. This falls asleep and you can now steal the diamonds around her neck. - Use the gem on the safe and open afterwards to find the right drawer of the table by a key Heart. These you use in your bedroom at the closed treasure chest. You receive a broken recorder. - So use telekinesis on the loudspeaker and combine the obtained there from Item with the broken recorder. Use the recorder at the door in the entrance hall to accommodate the voice of the witch. Then you use the unit at a safe and it opens a passage in the ground through which it enters the basement. Below you'll find in front of a talking mirror that you also tried to help. Take a look at the blueprint of the building, which you found in the safe, and this now resides in your inventory. Anna noticed that there is a loft and thus also a roof. Look at the books and make sure to read through all of this will be to assist you in finding the listed items. Go upstairs to the room with the rat and grab the hanging witch hat. - Now enter your bedroom and use your telekinetic powers to the weak spot on the ceiling to bring the slump. - Use the Book of party tricks on the witch hat. This will get you a cloth rope, which you combine with the paperweight and use it on the broken place. Go up on the roof, look around and then put yourself back to the attic. There use telekinesis to the fragile site in the roof a hole to make it. - Look through the hole, let the raven greet. Get your mirror and climb up onto the roof, where you apply the mirror on the raven. This is now distracted, so you can get hold of a pen through the hole in the attic. - Go down into your room and bring you the lens of the camera, which is in the bed. Then you climb back onto the roof Look at the moon, and then use the lens on this. Now the lens is charged, this combined with the amulet. - Run down to the cellar and bring you the cloth of witch which examined for hair. Click on the cork, which is on the wine bottle and put it on. Go to the room with the rat and see the sink, Anna discovered in nasty wet hair in the sink. In the entrance hall you look more closely pipe that Anna will open and stuff using the cork can. Go back upstairs and turn on the tap to you to fish some hair from it. After you speak again with the spirit Joringel which asks you to find a gold ring. This is not far away, because it is in the basement. Surrender the jewel of the spirit and will open the left drawer at the table. You will find a string. Then you find yourself in front of the basement, where the grid opens telekinetically on the ground and are allowed now look into some sort of cesspool. Use here initially telekinesis on the thumb, then the index finger and finally the little finger. Combined in your inventory the bent spoon with the cord and used the new item to pull the napkin out of the cloaca. Go up in your bedroom and put the handkerchief on your bed, after which you fall asleep and dream of Anna her grandfather. After a silent ghost dream girl will appear. Go to your finding down to the basement, where there is a heart-rending reunion between Joringel and Jorinde. After the reunion climb up to the loft and open the cage with the red dragon in it. You grab the dragon and combine this with the blue crayon. Now you have all the ingredients to cooperate to the necessary magic. So use the boiler in the basement and add the Raven, the hair of the witch, the charged amulet and the fiery dragon. After talking to the mirror you find yourself back in your bedroom, can be found on Winfriede. Once you have control over Anna again, you use the brain icon on the wand witch. You have the old woman now trick and flee with your beary friend out of the building end up doing in a forest. Here you encounter a broken fox, which would like to have the red fruit. To get the healthy food use your telepathic skills on the central Branch, then the upper branch and last on the lower branch. The Fox is happy with the fruit and thus lead you on the way to Wunderhorn, which is equal to the corner. Finally you come to the small mystical village Wunderhorn. Ben, who is now dressed up, standing in front of the tavern, and waits until Anna every minute task. So go to the tavern and talk to the bartender, whom you interrogate about the magician and the sacred objects. You learn that one of the most coveted objects located by the lake, but there you come out only with a guide. The permanently drunken Gil could accompany you, for example there. Go outside and into the alley, left of the church. There you will find in front of an old woman who borrows your spellbook. In exchange for the Magic Book, you open yourselves to the passage to the magic shop. In the shop you will meet the sorceress, who educates you about the three magic objects: a rose, an amber ball and the one of you granted spellbook. Leave the store and again visit the tavern, there use telekinesis to the tube on. Leave the tavern and pull the lever at the fountain in the center of the city. Now return to the tavern, where Gil is shocked that no more beer flows and thus accompany you to the lake. Speak with the blacksmith in the forest and return to the city. Once there, look for the daughter of the blacksmith to give information about the whereabouts of her father. Go left to the forest trail. There you talk to the "bush" which itself turns out to be Reynard, the fox. In the village the rumor of a fruit-loving monster makes the circulation because Anna was immediately on the Fuchs. After talking to her go back there and talk to the donkey Roostwig, click three different call options. Then you bring in a haystack right in the picture a needle. Go into the alley that leads to the sorceress and use telekinesis on the hanging bed sheets. Return to the fountain and enter the antique shop. There you will present the shop owner the diamonds from the inventory. He gives you in exchange for a lantern. Leave the shop and talk again with the daughter of the blacksmith. Then go to the spot where you have found the blacksmith. Then use your scissors on the vines. Go upstairs to the hut. There the thieves don’t want to get out, it is clear that they are afraid of ghosts. So combining the first vines with the needle, then the resulting object with the bed sheets. Cut the sheet with scissors a little handle and then combine this with the lantern. Now another knock at the door and set the wrong spirit by your telekinesis to move. Go to the lake and talk to the spirit Hans. This tells you that the mermaids are gentle melodies. When it comes to music, you know already that you return to the village and talk to the donkey. This is looking for a new home for himself and his troops. By distributing the robber out of the hut, they now collect the opportunity there. Accompany you there and talk to the scene again with the donkey, this gives you over an old violin. Return to the village and go to the antique shop, where you use the brain icon on the top right of the monkey image. This directs the owner from a short time, so you can replace the old magic violin. Leave the place and go to the lake where the magic violin finds its application and you will receive as a reward the amber ball. You are back in the village, now it is time to enter the church. A conversation with the priest follows, after which he sees you, the window in the background in more detail. Go to the tavern and use your kite in combination with the charcoal in the fireplace. Then you walk up to the street and use telekinesis to the streetlight around this bend down. Now you use the fiery dragon to the lantern to illuminate. Leave the village and go to the stump in the woods, where you should take a closer look. This represents some codes which are useful to you. Return to the church back and play the organ using the codes found. The locked door opens, which transported you into the bell tower. By applying your telekinetic abilities at the bell, you bring them to sound. A great dragon is emerging, which shows you a baby dragon. In gratitude for the recovery of his child, you bring the dragon to the icy mountain. Once there, it knocks on the door and asked the owner of the cottage, the magical rose. So go behind the rocks to the right and from there use telekinesis to open the window. The old man looks out through the window and at the moment you should use brain icon again to pinch his beard. Free the poor man, who then involuntarily leaves the Rose. Now you lack only the spellbook. Revisit the tavern, in this you discover a new face. Speak first with the innkeeper, then with Gottfried. This is too sad that he wanted to carry on a conversation. Speak to the publican, this tells you that Gottfried's son had disappeared. So you're talking about the desperate father again and offer him to bring back his son. - "With what kind of spell did you get the book is?" - "Why did you ever kidnapped all the children?" - "I've already experimented a bit with protection spells. I could also find him alone." - "I'm on your side. I understand now. I can not stand children also." - "* Sigh * It's true ... Never will ever reach a witch your size." Then go to the village and talk to the sorceress. This helps you complete the wards. Now you're set aside the magic and be able to take the book to you. As soon you have gathered all three magical items, give this over to the sorceress. However, it turns the whole case as a trick out behind the outward appearance of the sorceress, actually hides the witch Winfriede which immediately banished you to hell. - "Winfriede is a wicked witch!" - "It seems your work not just for fun." - "Ah, forget it ..."
After talking with the guard you hear a scratching and rustling at the grating, Reynard appears. Speak with the fox and asks him if he knew the guard and tells him that you are the opinion of the guard would notice. Click afterward on the mattress and take the spring. In your inventory menu you can now bend the spring and thereby make this a Dietrich. Use this to leave your cell and go to prison gate. Talk to the Troll office and asks him where the main office is, you would also need a form and let him continue working afterwards. Go to the gate of the villa and talk to the big Troll. Asking him questions about the visiting hours and if he could leave a message for you. Speak to him even on his break and return to the hallway. - "Why you want you because ... you know ..."
- "What did you see in the room?" - "Winfriede has a room in the castle? Royal Castle?" - "What's up with the names of flowers to be?" Use telekinesis to either the executioner or his ax. Now, the method of execution and you go to the Administration Troll. Here you can ask him regarding the inspection and receive promptly the job. Go into the storage room, and get a torch. Go down to the room and use the torch, you find a squalid man. This worried water, take the can at gibbet and fills it with water at the cooler. Speak again with Winfred and asking him questions about the sleep-inducing flower. Now, when you return to your cell, you ask to get you this flower Reynard. Throw it in the blender with and give the big Troll at the Villa your special "drink". Now you can knock on the door and talk to the devil, tell him that you are innocent, and really wanted to help only your Grandpa. Also you want to stop the devious witch Winfriede. The devil asked of you to solve two puzzles. End the call and speak to the large sleeping troll on after you talk to Wilfred and asking him questions about the favorite food of the devil. Run to the prison gate and see the documents more closely, then you can by using telekinesis jerking off the searched document. Now you have the necessary information and it clears that the devil on his favorite food. - "A dead Hundehai from the Great North Sea ..."
- "The rib of a whale ..."
- "The hoof of an old horse ..."
Shortly after you make yourselves, then on the way to solve the second puzzle. Use the mailbox and show the new Get ends Winfred note. Another shows you that the Administration Troll in the dungeon gate. Now go into the hallway and open the door. Here you can find in front of the correct Wizard of Wunderhorn and go all the dialogue options by time. Take some of the meat, which is right in the corner, passing the piece to the devil in the Villa. Then you see the true shape of the devil through the keyhole and therefore have the mystery solved. In the prison gate you ask the working Troll concerning the forms for the group, and then let him continue working. Through your telekinetic powers you bring the inkwell drop and thus to throw the troll into the form lava. Now go directly to the cages and pressed the lever so that the left lever up, the central lever down and the right lever in the center stand. Return to the Administration Troll and cast again the inkwell. Now you can get in the cage the form by returning it to the Bear in exchange the honey. During another conversation with the devil you told him again that you have done nothing wrong, you will stop and your grandpa Winfriede wants come to the rescue. - "I'd love to amaze me by your swordsmanship and enchant leave!" - "But you've already won! You got him!" - "A gap in the cover! This is your chance!" - "And then ... they attack you suddenly!" - "Oh but he ... He hits your sword hand!" Cancels the glass slipper and go into the royal garden around the tree a dress to get paid. Unfortunately your dress is too big, but you will have to change it. First go into the palace and enter the bedroom of the princess. Here you can find some magazines. Go down to the kitchen and ask the cook what they cook and so they questioned with regard to the lack of flesh. Grab the nightingale, the cage waiting for him to you, and use the dress to the knife. Your next step should be to go to the pigeon tower there to rip the ladder under the nail. Back in the entrance hall you will find the fool Jester. Ask her why she appears in such a desolate area. Bring her then pay on the idea of a cook visit. Then follow her in the kitchen and used telekinesis to Jester. After that you share with the fool, that also demanded the princess for some entertainment. Also in the bedroom of the princess, then you click should the brain icon with Jester. Grab also the second shoe and go into pigeon tower. Here you use the golden brooch with the coupon and then the object obtained by the yarn. Look at the hanging note and use the balloon on the dove. There now follows a minigame. You did it and now you can attach the message to the dove. Go to the cellar and give the golden thimble Cindy. Now run back into the basement and use the nightingale of the coal to the bird to turn black. Now go out of the castle and use the ladder to the highest left window. Now you can climb up to the camp and find the wrong sorceress Winfriede and the captive Ben. Increase again up to the camp and exchange the owl against the black nightingale. Then you should go to the kitchen to the pesky owl lay in the cage. Ben visit through the window and tell him that you have no time to lose. Click twice cut purely on the picture and go back into the kitchen a few holes in the image using the knife. Back in the camp you lay the image back into the frame and wait for what happens. Is the evil Winfriede gone, you open the cage and free Ben with your telekinetic powers. Look after the board a little more closely and snap the photo and snippet on the mirror, these then combined with the portrait of your inventory. Again two thought bubbles which connects you with each other in the inventory. Now go back to the beginning and talk to Reynard. Ask him for a favor, after which you will then fly with the dragon to the mountain. Knock on the door, the old man will let you clean after much back and forth. Now use Winfriede’s message with the broken glass on the ground, you still missing. So you fly back to the castle, through the Head of the camp and found here in the drawer the letze glass splinters. To calm the little thing use telekinesis and return to the mountain. Use the last shard and the sleeping Jannike is awakened. Go with her through all the dialogue options and then lift the flowers on the left. Go out to the Dragon, this brings you to the castle. It follows the grand finale and the Enlightenment as it could go so far with Winfriede. You now find yourself in the past and do not travel more than Anna, but as the young Winfriede around. She holds on in the classroom, together with her mother. Grab the bellow on the blackboard, the chalk and some coal from the oven. Then open the table below in the middle and look at the mess more closely, then you talk to Dorothea. You may now leave the classroom and outside to talk to Jacob, Jannike or Willhelm. Your attention should turn to her but Joringel, ask him why he is so alone. Ask him if he tasted the berries and then go to Jorinde over to make her aware of her loneliness. Now you can go to Joringel back and call him a fool, because there is very probably someone who likes him. Talk to Jannike and then with Willhelm, thereby select the dialogue with the problems. Make your way to the tree house and now operate the code on the stone (left, right, right, center, left, right, left). In the treehouse you talk to Hans and ask him regarding the spell with the eyes, the Telekinesis and what he needs to produce the candle. Here use the bellow with the dry ice. The coal can apply on dragons. Now you grab only the book right and throw the same at it. Go up the ladder and look out of the window because it uses the gas-filled bellow at beehive. Now you can pick up the hive and give it to Hans her outside. Back in the courtyard you speak with Jacob and asking him questions about the flower. Power then nervously him and has it out that you knew the true meaning of the flower. Now you give the hive to Jacob on and go into the classroom afterwards. Open the table right here in front of the oven and grab the letter, which your inventory list. The dragons are used quickly by the stove and then return to Hans to bring back to him to make his test because you could help him. While your friend makes the test, you grab the key and use it in the courtyard of the shed. Here you will find gloves. Show the found letter to Jacob and give the blue flower Joringel. You go to the tree house and use the gloves with the dry ice. Talk to Hans and bring him again to take the test. The dry ice should use during the test on the teapot and then return to the treehouse. Present Hans the chalk, the flower and the yo-yo. Back in the courtyard you grab quickly some blue berries and hand over this to Hans. It follows an incantation scene, which brings no good to light. Winfriede is of the amber ball obsessed to pick up, so you go to Jorinde and questioned her in this regard. Then follow the sad finale of Anna's Quest.